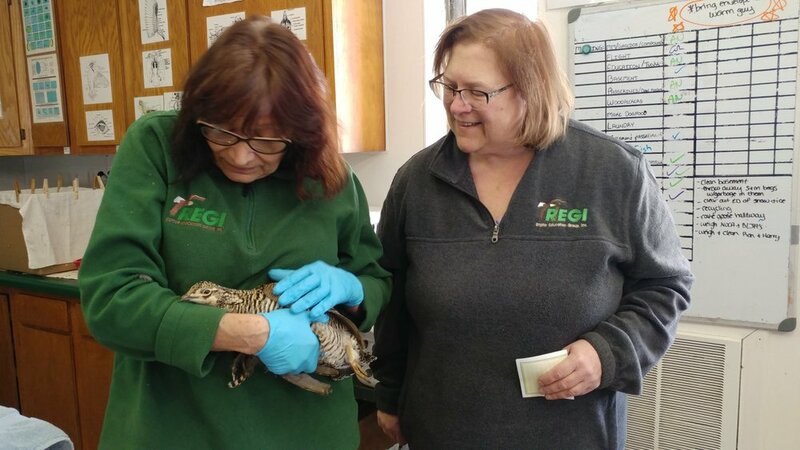 Prairie Chicken Admitted — Raptor Education Group, Inc.
For the first time ever we admitted a Prairie Chicken, a State of Wisconsin threatened species, to REGI for care. The prairie chicken was hit by a vehicle and suffered very serious injuries including internal bleeding. She was in extremely critical condition when REGI volunteer, Kathy Esqueda transported her to us. The prairie chicken remained on the edge of life for 10 days. The great news is she is now recovering and we are optimistic she will be able to rejoin her flock in the Central WI Grasslands Management Area in time for breeding. Prairie Chickens were brought back from near extinction in Wisconsin starting in 1954. They are still a threatened species in our state and are highly managed to maintain their population. As in many wildlife success stories, a small group of dedicated people were responsible for bringing Prairie Chickens back to our state. The State of WI DNR and students at UWSP College of Natural Resources play major roles in maintaining the population. Thanks to everyone that helped including a birder that found her on the road and got her to the Zack, a Wildlife Technician with the State of WI DNR. Zack called REGI and our transporter Kathy Esqueda was on the way to transport her to us within 30 minutes. Thanks Kathy Esqueda for transporting this VIB ( Very Important Bird) to REGI for care. Updates on the Arctic Gang!